What is a WHMIS Certificate and How to Get One? 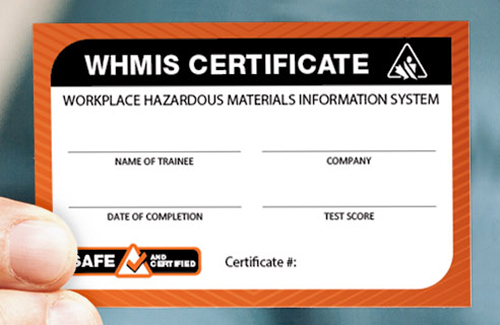 A WHMIS certificate is a document issued after you've taken a WHMIS training course. The training may be provided through your employer or a training company. WHMIS certificates are issued by employers or the training company who provided the instruction and not through Health Canada or any other government. Although it is not a legal requirement for employees to have a certificate to show completed WHMIS training, almost all of workers in Canada will be required by employers to take WHMIS training. This is because it is required by Health Canada for employers to have an implemented WHMIS program at their workplace. Learning about WHMIS is learning about how to keep yourself and others safe from hazardous materials. It is important to have a certificate, but it is more important to obtain and retain the right kind of knowledge for you to perform your work responsibilities safely. The cost for WHMIS training can vary from program to program and most employers will provide this training at no direct cost to the employee. There are many methods and providers of WHMIS training. Often opportunities for WHMIS will be provided directly through your workplace and the programs will be tailored to your specific work environment. Workplace specific training should be available through your company if you will be directly handling, storing or disposing of hazardous materials. If you don't see the training readily available to you, then it is appropriate to request it or request how you are expected to obtain it. With any kind of training, it is important to select a high quality WHMIS education provider, and one that will provide the most value (best information retention in employees) for the time and money. Ensuring your WHMIS program materials are always up to date is also extremely important as the amount of health and safety regulation and enforcement is steadily increasing. If you are looking to obtain your own WHMIS training and education or select a program provider for your company, here is an overview of a variety of types of training. Classroom-based education is an effective system to deliver your WHMIS program to a large group of people at once. Many providers of WHMIS training provide instructors or a Human Resources department can develop and train their own employee to deliver WHMIS training. In a group, participants can engage in group exercises and discussion with other employees, often with subject matter that is highly specific to the individual company. This setting encourages information retention, but one drawback is that it often takes a long time to communicate information to a group that could be communicated in a shorter amount of time to an individual. Because there is less opportunity for real-time feedback, it is critical to select a method of self-taught WHMIS training that will result in successful learning for the individual. A program that offers non-interactive communication methods can be effective. Video communication can be compelling if the content is well presented and of high enough production quality and manuals that include a workbook component allow the opportunity to reflect back what you are learning. Online WHMIS training is optimal for speed and convenience. Often training can be delivered in a fraction of a workday at a fraction of the cost of other types of training. The certificate for education completed is often immediately attainable in a printable or digital format as well. Online education often can provide progress reports if multiple training courses are required per employee and can provide access to the most up to date materials. Employers may choose to review their WHMIS training program annually, or if workplace conditions or products change, so online training can be very useful for an employer. Home / Articles & Resources / What is a WHMIS Certificate?